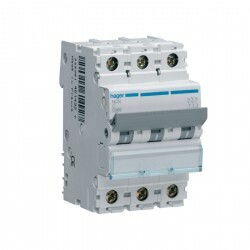 At UK Electrical Supplies you will find available Electrical Circuit Breakers from industry leading brands such as, Hager, Europa and Wylex. We stock, Three Phase Type C MCBs, Single Phase Type C MCBs, Plug-in type, Single Pole type and many more. You can find a range of quality RCBOs too. You can be confident that we only stock safe, quality products at affordable prices. Our customer service team is on hand to help you find the correct circuit breaker to match the consumer unit of your choice. If you would like to be amongst the first to hear of fantastic reductions on our range of circuit breakers, then please sign up to our mailing list. Our customer support team is just waiting to help you find exactly what you need. With our ‘Free Delivery’ policy on purchases over £50 and our ‘Next Day’ delivery service, there are so many reasons for you to come to us for your Electrical circuit breaker solutions.